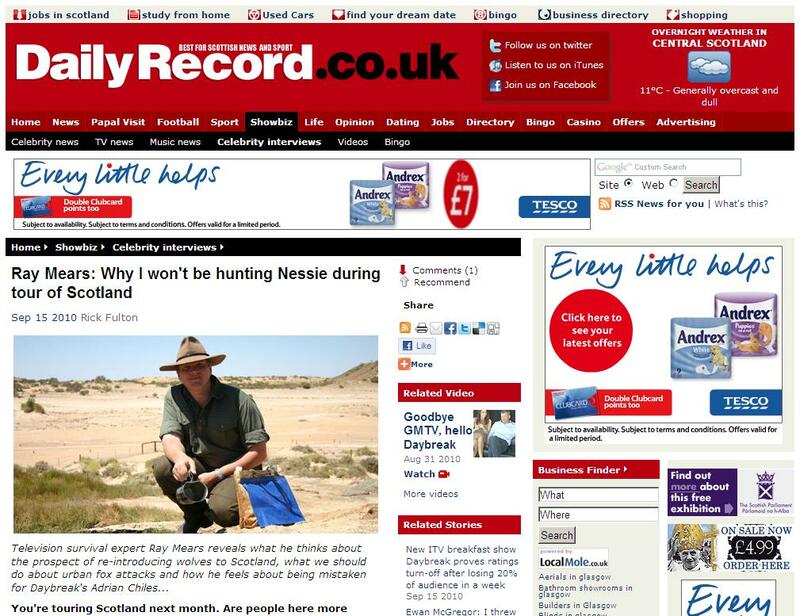 In the lead-up to Ray Mears’ forthcoming lecture tour across Scotland and Ireland this year, Ray was recently interviewed by the Scottish Daily Record. This entry was posted in Ray Mears on September 21, 2010 by Woodlore Team. Ray is great on Daybreak and I think Christine does really well to keep up with working on the two shows, she must be very busy doing daybreak in the morning and the one show at night. What a great little article. Some quite insightful questions with some well though out answers. Also some of the usual low brow questions that seem to follow Ray around. I do wonder how he keeps a smile and answers these in good humour. I had the chance to see him in Llandudno for the Northern Wilderness Tour and he kept a great sense of humour and calm at those usual inane questions. Personally Rik I don’t see the likeness! There is only one Ray Mears!! Does Ray ever get mistaken for Adrian Chiles!? A great Comic relief gag in the making!